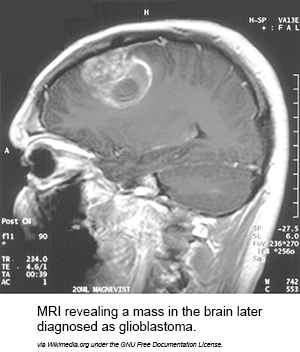 Although researchers can’t quite toss out their microscopes, two new studies reported in the New England Journal of Medicine show that variations in brain tumors’ genomics can be used to determine the best course of treatment for patients with certain kinds of tumors. For the most part, doctors have analyzed tissue samples to categorize and predict tumors’ potential trajectories. The papers’ authors show that genome scans of patients’ tumors remove several degrees of subjective analysis leading to more accurate diagnostics and earlier, better treatments. A team led by researchers from the Mayo Clinic and the University of California, San Francisco also studied glioma genes and also found that they could categorize tumors by certain mutations and that those mutations were responsible for varying disease trajectories and treatment responses. “We found consistent associations between the molecular groups and age at diagnosis, survival, patterns of acquired alterations, and germline variants across the three data sets. This consistency is remarkable, given the different methods of case ascertainment that were used in the three different series that we analyzed (cases in the UCSF Adult Glioma Study were population-based and clinic-based, cases from the Mayo Clinic were referral-based, and cases from the TCGA project were selected primarily on the basis of tumor size).” From Glioma Groups Based on 1p/19q, IDH, and TERT Promoter Mutations in Tumors by Eckel-Passow, J. PhD. et al. These findings are additions to a growing list of instances in which researchers are finding more and more justifications for adopting personalized medicine in routine healthcare. As more of these instances crop up -- and we’re sure they will! -- the need for interoperability becomes clearer. There won’t be a practical way to justify closing off healthcare systems when precise diagnoses and earlier interventions might be a few keystrokes away.